When the moving crew shows up at your door to pack your household belongings into the van, your large appliances need to be clean and ready to load onto the ramp. There are services available to thoroughly clean and prepare your appliances for a move, or you can do the job yourself. When you properly prepare your large appliances for a move, they’re far more likely to survive the journey and work for you in your new home than if you hadn’t taken the time to do so. There are a few tips to remember as you make your appliances ready for the relocation. Some people leave their old appliances behind when they move. Many of these people take the gracious step of leaving all of their appliance manuals in a stack on the kitchen counter when they vacate the home. This gesture is very helpful for the new residents who will move into the home. If you plan to take your appliances with you when you move, those appliance manuals are also great resources for you. If you move internationally, the manual will let you know if and how the appliance will work in a different country. 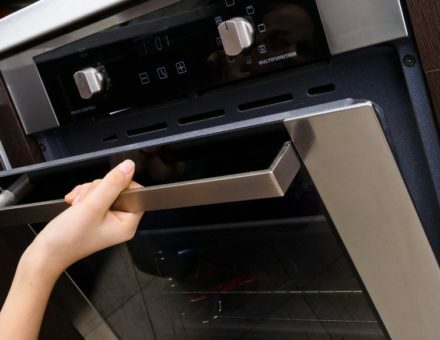 The manufacturer includes advice in the owner’s manual about how to disconnect, clean, and protect your appliance during a move. Locate all of the manuals you can find and put them in one file folder or plastic pouch. Place this document folder on top of the fridge or a location where you can find it quickly. If you can’t find the manuals in your drawers or files, you can source most of them online and print them out or refer to them on your computer. If you don’t have a computer, contact your appliance’s manufacturer to ask for advice about moving your appliance or request a new manual. It takes time to disconnect washers, dryers, dishwashers, and other large appliances that aren’t simply plugged in to the wall socket. You also need to unplug and defrost any freezers or refrigerators a few days ahead of schedule to protect these appliances from moving damage. Plan to spend an hour with each appliance to give yourself plenty of time to detach hoses, plugs, ducts, and drains. The tasks involved in disconnecting your appliances vary from appliance to appliance. If you have gas appliances, call your gas company to shut off and disconnect gas lines to these furnishings. Gas lines are fragile and should only be disconnected by people who know what they’re doing. Once you have an appliance unplugged and thoroughly cleaned, collect the accessories that go with the appliance. You’ll need these in the new place, too, so develop a system before you move to keep track of parts and plugs. Some people use large freezer bags they tape to the inside of the appliance. Inside the bag, place the owner’s manual, the cord (if it unscrews from the back of the appliance), hoses, and any fittings needed to connect the appliance to water or gas. Other people designate one large tote as the appliance fixture container. Inside the tote, they put all of the manuals, hoses, plugs, fittings, and attachments for the appliances they’re taking along on the move. The duct hose for the dryer can be saved and brought along with you, but it will be very full of lint. It may not be the right length to fit in your new home’s laundry area, either. If you already know it won’t work in the new home, keep a small bit of it, or measure the diameter of the hose, so you can easily buy the correct size for your new home. After collecting all of the accessories and making sure they’re clean and ready to go, tape up the doors of appliances so they don’t swing open during the move. The moving crew can also do this step for you. As noted above, you must start preparing your fridge and freezer a few days ahead of time. Unplug, empty, and clean the fridge. Remove any loose items including ice containers. You can leave drawers and shelves in the fridge, but clean them thoroughly so no odors develop during the move. Alternatively, you can remove and pack shelving. Your moving crew will move the fridges and freezers correctly. Even so, you should give your fridge a 24- to 48-hour waiting period in the new home. When a fridge or freezer is tipped, oil from the compressor can flow into the cooling lines. If you turn on the appliance before the oil drains back into the compressor, you can permanently damage the appliance. Contact Bekins Van Lines Inc today to arrange for trained crews to pack up your appliances. We use blankets and other protective measures to keep appliances safe and free from scratches and other damage.